I have enjoyed working closely this session with Senator Curtis King (R-Yakima), who chairs the Senate Transportation Committee. Senator King and I serve on the committee together and happen to sit next to each other in the Senate chamber. He’d probably be the first to agree that I am not shy about advocating for our 12th District transportation needs. This week brought the session’s final deadline for committee work in the Senate and House. While committees aren’t prevented from meeting to address a late-breaking issue, our attention now in the Senate chamber involves voting on House bills that came forward from Senate committees. The Senate also has approved a transportation budget for 2017-19. It contains an important new appropriation for our area that I hope to see also in the corresponding budget adopted by the House or in the final agreed-upon budget. With the Senate’s passage of all three of our budgets – an operating budget, a capital budget and now a transportation budget – we are hopefully closer to adjourning on schedule. While there are major differences between the Senate and House on how much to spend for state-government operations, and how to pay for that spending, there are still more than two weeks left in our regular session to work toward a final agreement. Our ability to avoid an “overtime” session will depend in large part on whether the House majority continues to insist that big new taxes are needed, including the first-ever state tax on income from capital gains. The operating budget approved by the Senate increases spending on K-12 and higher education, and other important services – mental-health treatment, for instance, and assistance for people with developmental disabilities – but it does so without requiring new taxes. The replacement of the US 2/West Cashmere Bridge has been a high priority of local officials for many years. As I reported in an e-newsletter last week, work to gather funding has been under way since 2009 and resulted in $18 million toward a projected bridge-replacement cost of $23 million. Unfortunately, the project was not included in the Legislature’s 2015 “Connecting Washington” package. The outlook for this critical project brightened yesterday when the Senate transportation budget we adopted included another $2 million toward the US 2/West Cashmere Bridge project. Most revenue available for transportation projects is already committed, so it is unusual to secure an appropriation of any significance, especially $2 million. 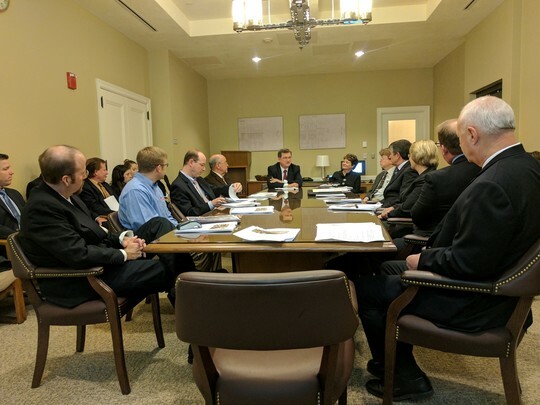 Credit for this good news belongs to local ambassadors for the project who met with the Senate and House transportation committee chairs March 22 alongside me, Representative Condotta, and Representative Steele. The group presented a compelling case – how replacing the 85-year-old bridge which carries Goodwin Road across the Wenatchee River and the BNSF rail line is critical for freight mobility and public safety in the Cashmere area, and how most of the funding is lined up already. I’m very excited about what we’ve accomplished so far, and optimistic that the US 2/West Cashmere Bridge project will be included in the final transportation budget negotiated between the Senate and House. I also will look for opportunities to secure the remaining $3 million needed and am ready to help seek funding from other sources, such as freight-mobility grants. I will not slow down on this project. It is too important. The Senate's support for the US 2/West Cashmere Bridge project is due largely to the March 22 visit by city and county leaders with (at far end of table) Sen. Curtis King, R-Yakima and Senate Transportation Committee chair, and Rep. Judy Clibborn, D-Mercer Island and House Transportation Committee chair. 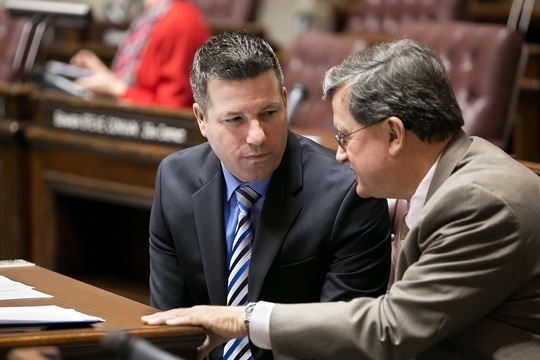 The first bill I introduced as a state senator was also the first bill of mine to receive Senate approval. Yesterday that legislation, Senate Bill 5270, also received unanimous approval from the House. If the House had made changes to that bill, it would have to return to the Senate for what is called “concurrence” – meaning we would vote on whether to go along with the changes. But because SB 5270 was not amended by the House, its next stop is the governor’s desk. The Department of Natural Resources operates a contract-harvest program that allows the agency to hire someone to harvest timber and sort the logs, after which DNR can sell them. The program was established in 2003; it was expanded in 2009 on a temporary basis to see if the changes would work as intended. SB 5270 will take off the “temporary” label, making the program permanent. The House also approved Senate Bill 5649 yesterday – and also without changes, so it too will head for Governor Inslee’s desk. Okanogan County is one of three counties in our state not involved in a Regional Transportation Planning Organization. That will change under SB 5649, which I introduced at Okanogan County’s request. RTPOs exist primarily to prepare regional transportation plans and to coordinate planning efforts within counties. Chelan and Douglas counties had formed an RPTO together in 2013, leaving Okanogan County needing to form its own. My change in law will allow it to do so.